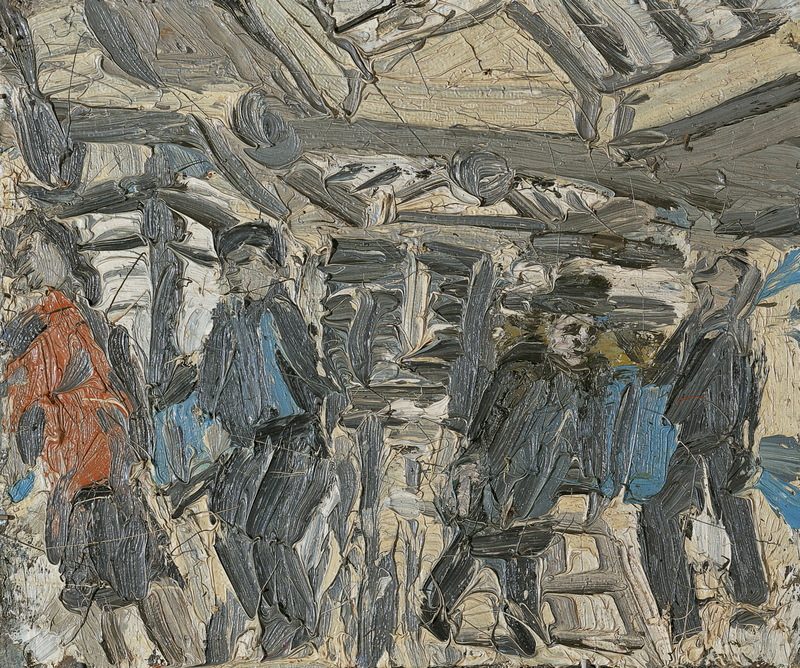 Observation is an obsession for Kossoff, and each of his works is preceded by numerous preliminary drawings. He needs not only to observe but to step inside the scene and translate the images into accidents of the brush. He employs traditional painting materials, such as charcoal, in his preparatory drawings. These are made from life in the presence of the motif, which, when transferred to canvas, is engulfed and transformed by the material and gestural quality of the painting. More than represent, his works discover and reinvent urban spectacle. Booking Hall. Kilburn Underground Station No. 1 belongs to a cycle that captures various impressions of Kilburn Street. In this small oil painting the painter takes us underground, into the station’s interior, where several anonymous citizens walk towards the platforms or queue to buy tickets. The scene is cramped on account of the impastoed, expressive brushwork, in continuous movement, and the very image of the oppressive space inside the tube station. Kossof ’s manner of loading on the paint thickly, layer upon layer, giving it the appearance of a bas-relief, is designed to symbolise the materiality of the physical world.